In this protocol we combine RNAi-mediated gene silencing with an in vivo diuresis assay to study the effects knockdown of genes of interest has on mosquito fluid excretion. Drake, L. L., Price, D. P., Aguirre, S. E., Hansen, I. A. RNAi-mediated Gene Knockdown and In Vivo Diuresis Assay in Adult Female Aedes aegypti Mosquitoes. J. Vis. Exp. (65), e3479, doi:10.3791/3479 (2012). This video protocol demonstrates an effective technique to knockdown a particular gene in an insect and conduct a novel bioassay to measure excretion rate. This method can be used to obtain a better understanding of the process of diuresis in insects and is especially useful in the study of diuresis in blood-feeding arthropods that are able to take up huge amounts of liquid in a single blood meal. This RNAi-mediated gene knockdown combined with an in vivo diuresis assay was developed by the Hansen lab to study the effects of RNAi-mediated knockdown of aquaporin genes on Aedes aegypti mosquito diuresis1. 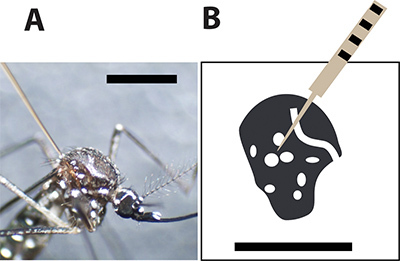 The protocol is setup in two parts: the first demonstration illustrates how to construct a simple mosquito injection device and how to prepare and inject dsRNA into the thorax of mosquitoes for RNAi-mediated gene knockdown. The second demonstration illustrates how to determine excretion rates in mosquitoes using an in vivo bioassay. Part I - RNAi-mediated gene knockdown in adult Aedes aegypti mosquitoes. For experiment overview see Figure 1. Synthesize specific dsRNAs against genes of interest and control dsRNAs. Note: We recommend developing primers for PCR fragments in the range of 300 to 500 base pairs located at the 3' end of the specific cDNA2 and with the T7 primer sequence attached at the 5' end (5'-TAA TAC GAC TCA CTA TAG GG-3'). Uniqueness of the fragments should be confirmed by BLASTN analysis3. Use the Ambion Megascript T7 High Yield Transcription Kit (Ambion, table of reagents) that utilizes T7 RNA polymerase for the transcription reaction to synthesize dsRNA. Note: similar reagents and kits are available elsewhere. To purify dsRNA, precipitate with lithium chloride following the instructions with the Megascript kit. After purification, dissolve the dsRNA pellet in sterile water. To ensure adequate viscosity for microinjection, the dsRNA concentration should not exceed 2 μg/μl. A simple micro injector can be constructed by using tubing, scissors, a metal needle, a 1 ml syringe, and a 1 ml plastic pipette tip (see Figure 2). 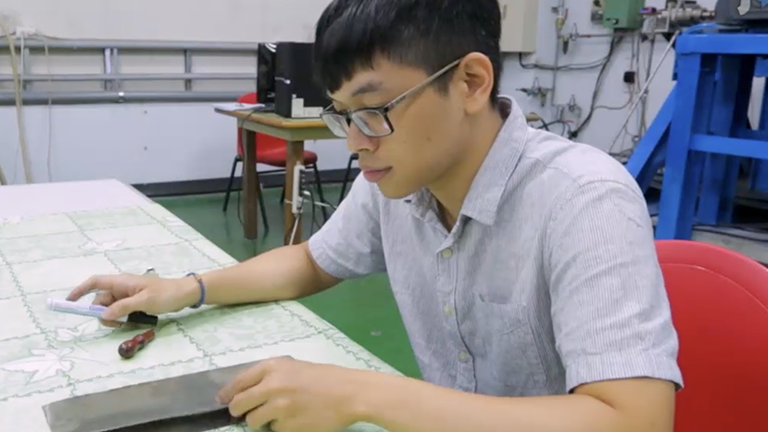 The tubing should be cut to ~ 40 cm in length. Alternatively, an automated micro injector can be used such as Drummond Nanojet II4. Cut the tip of the syringe (needle hub) at 2 ml scale mark and remove the rubber plunger head from the plunger. Punch a hole using a metal needle in the rubber plunger head and place the rubber plunger head back in the needle hub. 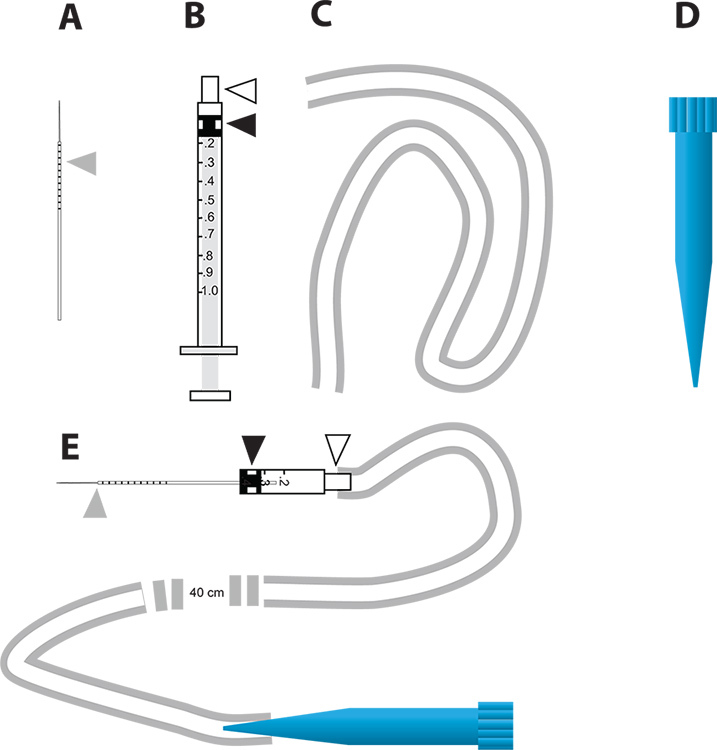 Place the needle hub in one end of the tubing and place a 1 ml plastic pipette tip in the other end, which will be used as the mouth piece (alternatively, a 10 ml syringe can be used to produce the air pressure necessary for injection). Place a glass capillary needle in the hole in the rubber plunger head and break the tip of the needle off so the width is big enough for liquid to flow through. Note: The optimal size of the needle tip has to be determined empirically - if the width of the needle is too big this will result in trauma and a high mosquito mortality rate, if the needle width is too small, it will be impossible to penetrate the mosquito exoskeleton. Submerge the injection needle in the prepared dsRNA sample and draw the liquid sample into the injection needle by sucking the liquid up with the mouth piece (or a syringe). Note: This step is identical for all liquid reagents that are injected into mosquitoes, including PBS buffer, which is used in the in vivo diuresis assay protocol (see below). Collect mosquitoes with a battery powered aspirator into a collection vial. Place a cap over the collection vial and place the vial on a clean CO2 pad to anesthetize mosquitoes. Note: Alternatively mosquitoes can be anesthetized on ice. Open the collection vial and place the mosquitoes directly on the CO2 pad and wait until mosquitoes are anesthetized. Line up the mosquitoes on the side to allow for easier access for injection. Grab mosquitoes by the legs or wings to avoid injury. You can also use a fine paintbrush or feather to manipulate mosquitoes. When ready to inject the first mosquito, gently support one side of the thorax with the forceps and insert the tip of the needle into the other side of the thorax (Figure 2). It is better to inject into a thin portion of the cuticle and avoid pushing the needle too deep into the thorax. Once the needle is in place, blow the liquid into the mosquito. The desired amount can be determined by monitoring the liquid meniscus in the needle. The number of millimeters necessary for a specific volume can be determined by calculating the cylinder volume of the glass capillary needle (πr2h). The effective amount of dsRNA that is typically used for injection is 1 μg. Once the liquid is injected into mosquito, carefully retract the needle. If a large liquid droplet forms on the outside of the thorax, the mosquito should be discarded. Then, repeat this process with the next mosquito. After injection, place the mosquitoes in a container for storage. For example, one pint wax lined cardboard cups (soup cups) with mesh covering secured with the cardboard lid. The lid has a portion cut out for the mesh covering to be exposed. Once all the mosquitoes are placed in the container, place the container in an environmentally controlled chamber for incubation and provide the mosquitoes with a food source, such as 20% sucrose soaked cotton balls placed on top of the mesh covering. Before performing the in vivo diuresis assay, deprive the dsRNA-injected mosquitoes of a water source for 12 hrs to standardize the hydration state of each mosquito. The efficiency of dsRNA-mediated gene knockdown can be variable. Gene silencing could begin 1 day after injection and it could last up to 6 days after injection4. The optimal time to achieve maximum gene knockdown has to be determined empirically for every gene used. Generally, we wait 3 days after dsRNA injection before we proceed. Note: This protocol has been developed by the authors and used for RNAi-mediated knockdown of aquaporin proteins in the yellow fever mosquito Aedes aegypti1. To avoid variability between individual mosquitoes, mosquitoes should be analyzed in groups. For technical reasons, we recommend groups of 5 mosquitoes per treatment - there is a limited amount of time to perform the first weight measurement before mosquitoes begin to excrete urine after injection. Before collection of the mosquitoes, record the weight of an empty collection vial with a cap using an analytical precision balance. This vial will be used for all subsequent measurements. Collect 5 female mosquitoes into the weighed collection vial with an aspirator. Place the cap over the collection vial and let it sit on the CO2 pad for several seconds to anesthetize the mosquitoes. Take the initial weight measurement of the 5 mosquitoes by placing the collection vial containing the mosquitoes with the cap on the precision balance. Calculate the weight of the group of 5 mosquitoes by taking the weight of the mosquitoes and the collection vial with cap and subtracting the weight of the empty collection vial with cap. Open the collection vial and place the mosquitoes directly on the CO2 pad after recording the weight of the mosquitoes. If the mosquitoes are beginning to wake up during the weight measurements, set the vial on the CO2 pad for several seconds before opening it and placing the mosquitoes on the pad. Set up the micro injector following the instructions given in the RNAi-mediated gene knockdown protocol. Place a glass capillary needle in the micro injector and break the tip of the needle off so the width is big enough for liquid to flow through. Submerge the needle in PBS buffer and draw the buffer into the injection needle, the desired amount to use for this protocol is 1.25 μl of PBS for each mosquito. Note: This amount mimics the average amount of blood plasma that is taken up by a female mosquito5. Line up the mosquitoes to allow for easier access with the micro injector. Once the needle is in place, blow PBS buffer into the mosquito. Once the liquid is injected into the mosquito, a droplet might form on the outside of the thorax. This droplet has to be carefully removed before the next step. Repeat this injection process with the next mosquito. With experience, mosquito survival rate will be almost 100% after injection. After the injection, gently place the mosquitoes in the collection vial and cap. Take the first weight measurement of the 5 mosquitoes by placing the collection vial containing the mosquitoes with the cap on the precision balance. Calculate the weight of the group of 5 mosquitoes by taking the weight of the mosquitoes and the collection vial with cap and subtract the weight of the empty collection vial with cap. Note: mosquitoes will begin to excrete urine within 2 minutes after removal from the CO2 anesthesia pad, so it is important to take the weight measurement before they start to excrete. Place mosquitoes in a small container where they will begin to excrete urine. Note: Weight measurements of the mosquitoes should be taken in 30 minute intervals, but this can be adjusted to shorter or longer intervals depending on excretion rates. After 30 minutes, collect the group of 5 mosquitoes with an aspirator into the same collection vial with cap. Take the next weight measurement of the mosquitoes by placing the collection vial containing the mosquitoes with the cap on the precision balance. After the measurement, place the mosquitoes in the same holding container for the next 30 minutes. Repeat this process for a desired amount of time. The total amount of liquid that was injected into the group of 5 mosquitoes can be calculated by subtracting the initial weight of the mosquitoes from the weight immediately after injection. The amount of urine that was excreted by the group of mosquitoes at a specific time point can be calculated by subtracting the initial weight of the mosquitoes from the weight of the mosquitoes at the specific time point. The excretion rate at a specific time point can be calculated by dividing the amount of urine excreted at this time point by the total amount of liquid injected (Table 1). RNAi-mediated gene knockdown and in vivo diuresis assay have been used by the Hansen lab to study the effects of aquaporins in Aedes aegypti mosquito diuresis. Three aquaporins that are expressed in Aedes aegypti Malpighian tubules were knocked down with significant effects on excretion rates compared to control mosquitoes1. 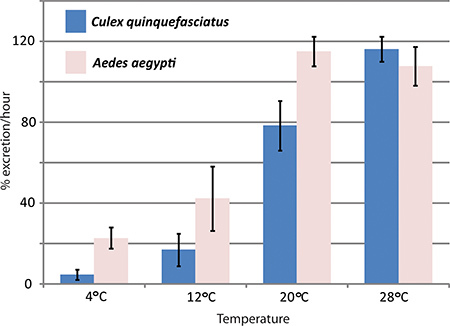 Figure 4 shows representative results of an experiment where the diuresis assay has been used to compare excretion rates between Aedes aegypti and Culex quinquefasciatus at different temperatures. Figure 1. Flowchart of the RNAi/diuresis assay. 5 groups of 10 mosquitoes each are injected with dsRNA for a specific gene and another five groups of ten mosquitoes are injected with control dsRNA. Another group of mosquitoes injected with 200 μM HgCl2 in PBS is used as a positive control. These mosquitoes are weighed before injection, and after injection in thirty minute intervals for 3 hours. Figure 2. A simple micro injection device for the RNAi-mediated gene knockdown and in vivo diuresis assay. A. The glass capillary needles used for injection. The gray triangle represents the millimeter increments drawn on the needle to indicate the amount of liquid injected into the mosquito. B. 1 ml syringe used to construct the micro injector. The white triangle represents the needle hub and the black triangle represents the rubber plunger head attached to the plunger in the syringe. C. The tubing used to attach the mouthpiece to the injector. D. 1 ml disposable pipette tip (blue tip) that is used as the mouthpiece of the microinjection device. E. The microinjection device that incorporates A-D parts. Click here to view larger figure. Figure 3. Optimal mosquito injection site. A. Female Aedes aegypti mosquito injected with a glass capillary needle between the large scales on the thorax. The black bar indicates 1 mm for size comparison. B. A drawing of the female mosquito thorax and the white spots represent the white scales in the mosquito exoskeleton. The injection needle should pierce the mosquito between the spots to minimize mortality rate during injection. Figure 4. Effects of temperature on Culex quinquefasciatus and Aedes aegypti diuresis. The diuresis assay was performed with two species of mosquitoes, Aedes aegypti and Culex quinquefasciatus, at different temperatures. The excretion rate during the first hour after injection is given in percent. Table 1. Aedes aegypti in vivo diuresis assay results. Raw data from the in vivo diuresis assay performed with Aedes aegypti female mosquitoes at 4 °C. The RNAi protocol used has been developed in the laboratory of Alexander Raikhel at the University of California Riverside6,7 and is similar to a protocol published by Garver and Dimopoulos4. The experimental approach shown in this video protocol can be used to study genes involved in insect diuresis in an in vivo setting. The excretory organs of insects, the Malpighian tubules, have attracted the interest of generations of researchers as a 'simple' model system for diuresis. This organ is involved in xenobiotics clearance8 and work in Drosophila has identified numerous genes involved in Malpighian tubule physiology9,10 which now can be studied in other insect species with reverse genetic methods like RNAi. Many homologous genes can be easily identified in the published genome sequences of various insect species11. Three-day old mosquitoes were used in this protocol because at this time point they become competent to take a blood meal. Several other excretion assays have been reported. The classic Ramsay assay has been used to study diuresis in isolated Malpighian tubules in vitro12. In this assay single tubules are isolated and the distal part is placed into a drop of saline solution while the proximal part is open. Diuretic activity is calculated by measuring the size of the urine droplet that forms at the end of the proximal part. Using the Ramsay assay, one can measure amounts of urine production by individual Malpighian tubules. Our diuresis assay allows for measurements of whole-mosquito excretion rates and is, therefore, not an alternative to the Ramsay assay. Instead, both assays can provide complementary information if used together. Other in vivo excretion assays have been developed for Musca domestica and Aedes aegypti. The M. domestica study involved the measurement of water loss by a flow-through humidity meter 13. A similar technique was used to study Aedes aegypti diuresis by measuring excretion rates using a precision humidity chamber14. The in vivo diuresis assay presented here is not as technically demanding as the above mentioned techniques and nevertheless produces very precise data on excretion rates in the context of a complete organism. There is a wide range of future applications for the in vivo diuresis assay presented here. In addition to reverse genetics methods like RNAi it can be used to study the effect of drugs, for example signal transduction inhibitors etc., on insect diuresis. It is also a powerful assay to study the process of xenobiotics clearance in target insects. Problems that we will address while further developing this assay are: A) The concentration and composition of the injection buffer. We used PBS for the experiments we performed so far but other buffers like Aedes Physiological Saline15 might turn out to be more appropriate for mosquitoes and other insects. B) Applying this method to other species, especially non-blood sucking insects. The amounts of buffer that can be injected into such species has to be empirically determined for each species. C) Minimize experimental error. We will optimize our injection and measuring techniques. The authors thank Victoria Carpenter for her critical comments of this protocol. Drake, L. L., et al. The Aquaporin gene family of the yellow fever mosquito, Aedes aegypti. PloS one. 5, e15578 (2010). Shepard, A. R., Jacobson, N., Clark, A. F. Importance of quantitative PCR primer location for short interfering RNA efficacy determination. Analytical biochemistry. 344, 287-288 (2005). Altschul, S. F., et al. Gapped BLAST and PSI-BLAST: a new generation of protein database search programs. Nucleic acids research. 25, 3389-3402 (1997). Garver, L., Dimopoulos, G. Protocol for RNAi Assays in Adult Mosquitoes (A. gambiae). J. Vis. Exp. (5), e230 (2007). Clements, A. N. Volume 1 Development, Nutrition, and Reproduction. The Biology of Mosquitoes. 2, Chapman & Hall. London. (1992). Hansen, I. A., Attardo, G. M., Park, J. H., Peng, Q., Raikhel, A. S. Target of rapamycin-mediated amino acid signaling in mosquito anautogeny. Proceedings of the National Academy of Sciences of the United States of America. 101, 10626-10631 (2004). Hansen, I. A., Attardo, G. M., Roy, S. G., Raikhel, A. S. Target of rapamycin-dependent activation of S6 kinase is a central step in the transduction of nutritional signals during egg development in a mosquito. The Journal of biological chemistry. 280, 20565-20572 (2005). Pannabecker, T. Physiology of the Malpighian Tubule. Annual review of entomology. 40, 493-510 (1995). Dow, J. New insights into Malpighian tubule function from functional genomics. Comp Biochem Phys A. 150, S135 (2008). Dow, J. A. T. Insights into the Malpighian tubule from functional genomics. Journal of Experimental Biology. 212, 435-445 (2009). Lawson, D., et al. VectorBase: a data resource for invertebrate vector genomics. Nucleic acids research. 37, 583-587 (2009). Beyenbach, K. W. Transport mechanisms of diuresis in Malpighian tubules of insects. J. Exp. Biol. 206, (Pt 21), 3845-3856 (2003). Coast, G. M. Continuous recording of excretory water loss from Musca domestica using a flow-through humidity meter: hormonal control of diuresis. Journal of insect physiology. 50, 455-468 (2004). Kersch, C. N., Pietrantonio, P. V. Mosquito Aedes aegypti (L.) leucokinin receptor is critical for in vivo fluid excretion post blood feeding. FEBS letters. 585, 3507-3512 (2011). Hays, A. R., Raikhel, A. S. A novel protein produced by the vitellogenic fat body and accumulated in mosquito oocytes. Development Genes and Evolution. 199, 114-121 (1990).